During my recent 12th District “listening tour,” a popular topic of discussion was infrastructure, especially with city, county, port, and school officials. Access to water, local trails, modernized school buildings, less-congested roads, and improved air travel are critical to our area’s quality of life and economic growth. A good example of an infrastructure discussion during my listening tour was a visit from Wenatchee Mayor Frank Kuntz and City of Wenatchee officials. 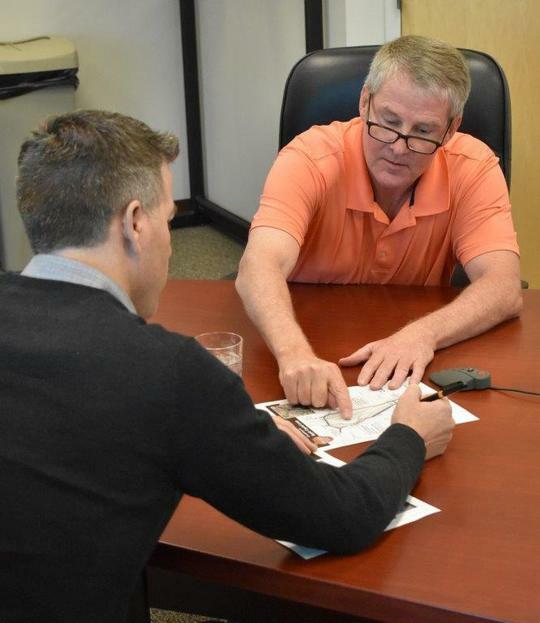 The mayor was energetic and hopeful about the city’s role in leading a major federal grant application to improve the region’s transportation infrastructure: the Apple Capital Loop Project (not to be confused with our loop trail). 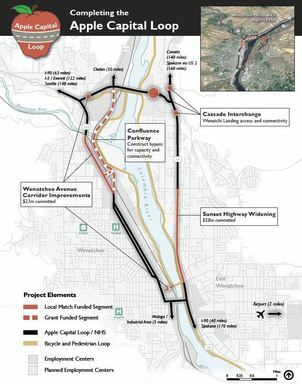 Wenatchee Mayor Frank Kuntz shares a map of the Apple Capital Loop Project, which would significantly improve transportation in the Wenatchee Valley. I appreciate the local interest and enthusiasm for this project (click on the map for a larger version), and I am appreciative of the city’s leadership efforts. Transportation is particularly important to our region (from freight hauling to tourism) and it supports our everyday lives. Good roads are especially important during natural disasters, such as wildfires. I also like that the project itself isn’t just about motorized vehicles as the new pedestrian bridge proposed will improve safety and access over the railroad to our riverfront loop trail for south Wenatchee residents. This coalition includes the Ports of Chelan and Douglas Counties, BNSF Railway, Douglas County, City of East Wenatchee, Link Transit, Chelan-Douglas Transportation Council, the State Department of Transportation, and others. Our community has seen the benefits of teamwork for other recent endeavors, so it is exciting to see it continue with this effort. Mayor Kuntz asked if I would support this federal grant application, and I enthusiastically agreed. There is, of course, national competition for these federal grant dollars, but I and the coalition supporters are hopeful. Thinking big and working together can be a very powerful force. We’ll know more about this project sometime next year. 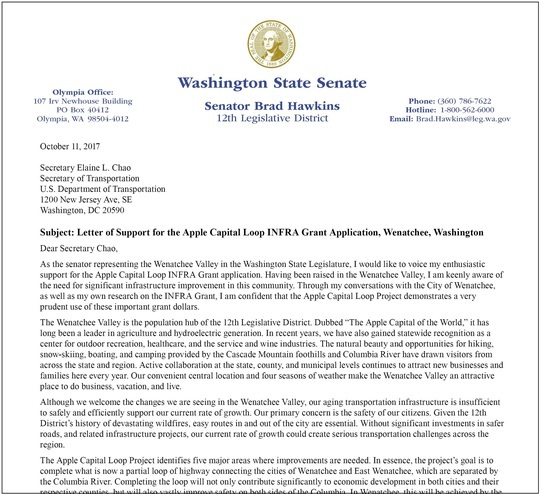 Click on the image to read my full letter to the U.S. secretary of transportation in support of the Apple Capital Loop Project. Thank you again for the opportunity to serve as your 12th District state senator. Please contact my office if you have any questions.